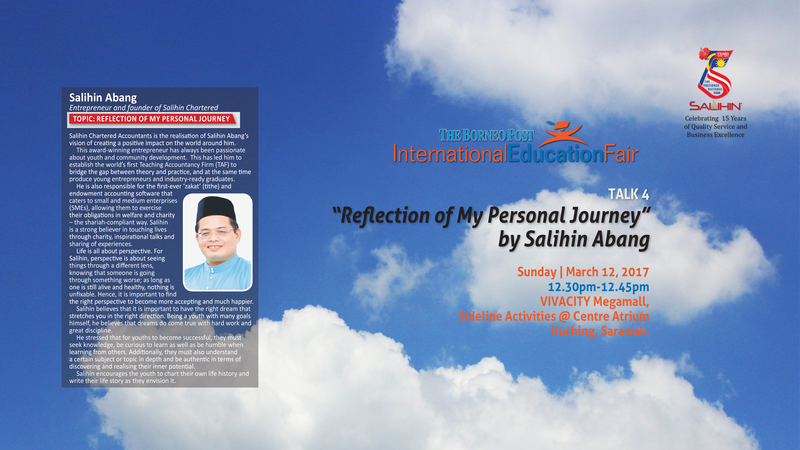 Born and bred in Kuching, Sarawak, Salihin set out his life and entrepreneurial vision to start and nurture a homegrown SALIHIN Chartered Accountants while massively impacting the world around him. As an award winning young entrepreneur with a fast-growing business, he is very passionate about youth and community development. His visionary leadership, ingenuity and genuine concern for the youth and the nation led him to establish the world's first Teaching Accountancy Firm (TAF) to bridge the gap between theory and practice, produce youth entrepreneurs and world-class industry-ready graduates. Also, he innovated the first ever zakat and endowment accounting software to sensitise and enable SMEs discharge their charitable obligations. Salihin is a strong believer of touching lives through charitable activities, inspirational talks and sharing of experiences. It is exciting that we are in an age where we could share and tell our stories / journey / experience / struggles and touch many lives. Life is all about perspective. For instance, when times are hard or you are upset over something trivial, switch your point of view for better perspective. Perspective is about seeing things through a different lens, knowing that someone is going through something worse, and as long as you are still alive and healthy, nothing is unfixable. Hence, it is important to find the right perspective and you will be more accepting and much happier. “Reflection of My Personal Journey” resembles the power of dreams, struggle and power of perspective in life. As quoted by Elen Johnson, “If your dreams don’t scare you, they’re not big enough”. It is important to have the right dream that stretches you in the right direction. Being a youth with many goals, dreams do come true with hard work and great discipline. Besides, for youths to become successful, they are urged to seek knowledge, be curious to learn as well as be humble in learning from others. Additionally, they must also understand a certain subject or topic in depth and be authentic in terms of discovering their inner potentials. Education matters since it allows a person the ability to gain knowledge, access positive learning opportunities and apply skills relevant for their future careers. Hoping the youths in Sarawak would be inspired with the topic not only for their personal and community development and growth, but also their career progression. You chart your own life history and you write your life story the way you want it to be.